Using a precision straightedge and feeler gauge, measure the warpage of the contact surfaces of the cylinder block and manifolds. 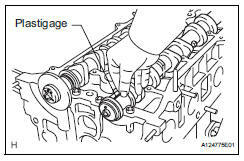 If the warpage is greater than the maximum, replace the cylinder head sub-assembly. Using a dye penetrant, inspect the combustion chamber, intake ports, exhaust ports and cylinder block surface for cracks. Apply a light coat of prussian blue to the valve face. Lightly press the valve against the seat. Do not turn the valve. Check the valve face and seat in accordance with the following procedure. If blue appears 360° around the face, the valve is concentric. If not, replace the valve. If blue appears 360° around the valve seat, the guide and face are concentric. If not, resurface the valve seat (see page em-87). Check that the seat contact is in the middle of the valve face with a width. Check the lock of the camshaft timing gear. Clamp the camshaft in a vise, and confirm that the camshaft timing gear is locked. Be careful not to damage the camshaft. Cover the 4 oil paths of the cam journal with vinyl tape as shown in the illustration. The 2 advance side paths are provided in the groove of the camshaft. Plug one of the paths with a rubber piece. Break through the tape of the advance side path and the retard side path on the opposite side of the groove. Apply approximately 200 kpa (2.0 Kgf/cm2, 28 psi) of air pressure to the paths whose tape was broken in the procedure above. Some oil spraying will occur. Contain the spray with a shop rag. Check that the camshaft timing gear revolves in the advance direction when weakening the air pressure of the retard side path. Gear rotates in advance direction. 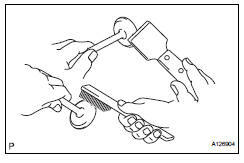 This operation releases the lock pin for the extreme retard position. When the camshaft timing gear reaches the extreme advance position, remove the air gun from the retard side path and advance side path, in that order. Do not remove the air gun from the advance side path first. The gear may abruptly shift in the retard direction and break the lock pin. Rotate the camshaft timing gear within its movable range several times, but do not turn it to the extreme retard position. Check that the gear rotates smoothly. 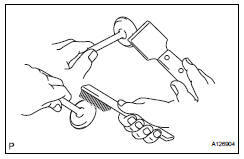 Do not use an air gun to perform the smooth operation check. Check the lock in the extreme retard position. Confirm that the camshaft timing gear is locked at the extreme retard position. Inspect the camshaft for runout. Place the camshaft on v-blocks. Using a dial indicator, measure the circle runout at the center journal. If the circle runout is greater than the maximum, replace the camshaft. If the circle runout is greater than the maximum, replace the no. 2 Camshaft. If the cam lobe height is less than the minimum, replace the no. 2 Camshaft. Clean the 10 bearing caps and camshaft journals. Place the 2 camshafts on the cylinder head. Lay a strip of plastigage across each of the camshaft journals. Install the 10 bearing caps (see page em-84). Remove the 10 bearing caps for the no. 2 Camshaft (see page em-60) and camshaft (see page em-61). If the oil clearance on the no. 1 Journal is greater than the maximum, choose a new bearing and install it. If the oil clearance on the other journals is greater than the maximum, replace the cylinder head subassembly or the camshaft. Install the 2 camshafts (see page em-84). Using a dial indicator, measure the thrust clearance while moving the camshaft back and forth. If the thrust clearance is greater than the maximum, replace the cylinder head. If damage is found on the camshaft thrust surfaces, replace the camshaft. Using a micrometer, measure the lifter diameter. 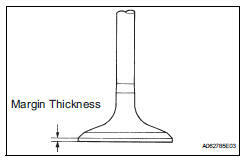 If the diameter is not as specified, replace the valve lifter. Using a caliper gauge, measure the valve lifter bore diameter of the cylinder head. 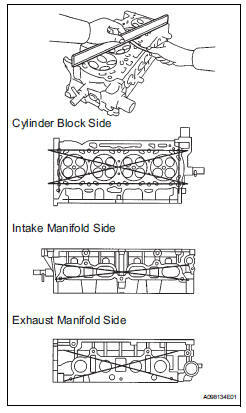 If the diameter is not as specified, replace the cylinder head sub-assembly. Subtract the valve lifter diameter measurement from the valve lifter bore diameter measurement. If the oil clearance is greater than the maximum, replace the valve lifter. If necessary, replace the cylinder head sub-assembly. Using a vernier caliper, measure the free length of the valve spring. If the length is not as specified, replace the inner compression spring. 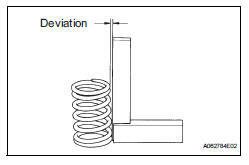 Using a steel square, measure the deviation of the inner compression spring. If the deviation is greater than the maximum, replace the inner compression spring. Using a gasket scraper, chip off any carbon on the valve head. Using a wire brush, thoroughly clean the valve. Using a vernier caliper, measure the valve overall length. 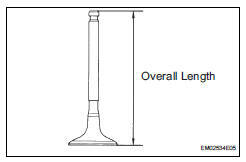 If the overall length is less than the minimum, replace the intake valve. 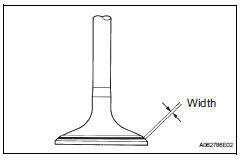 If the diameter is not as specified, replace the intake valve. Using a vernier caliper, measure the valve head margin thickness. 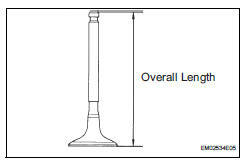 If the overall length is less than the minimum, replace the exhaust valve. Using a caliper gauge, measure the inside diameter of the guide bush. If the inside diameter is not as specified, replace the intake valve guide bush. Subtract the valve stem diameter measurement from the guide bush inside diameter measurement. If the clearance is greater than the maximum, replace the valve and intake guide bush. If the inside diameter is not as specified, replace the exhaust valve guide bush. If the clearance is greater than the maximum, replace the valve and exhaust valve guide bush. 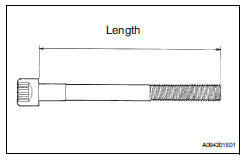 Using a vernier caliper, measure the length of the head bolts from the seat to the end. If the bolt length is greater than the maximum, replace the cylinder head set bolt. 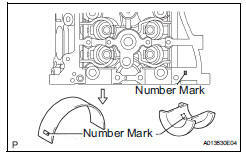 Using a precision straightedge and a feeler gauge, measure the surface contacting the cylinder head for warpage. If the warpage is greater than the maximum, replace the exhaust manifold.